You are about to live your dreams! 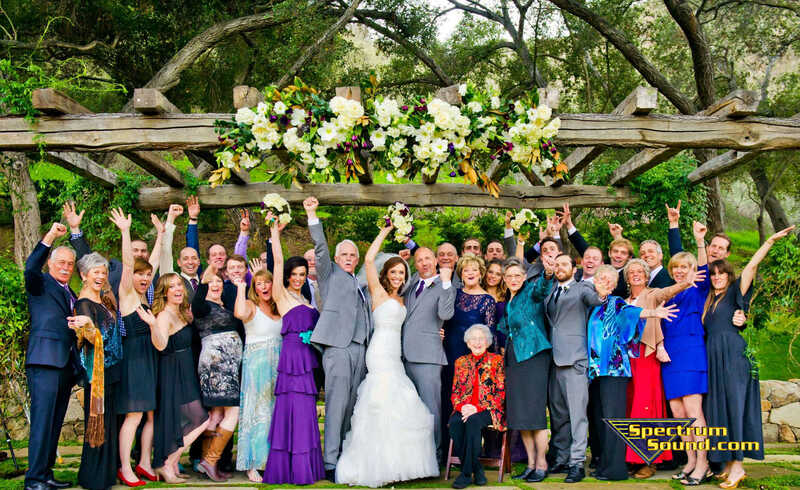 Spectrum Sound Entertainment can help you create a wedding reception that lets your dreams flourish. Imagine a packed dance floor. Imagine your favorite people on earth enjoying the time of their lives. Imagine a day united in celebrating the biggest event in your life: your wedding. Spectrum Sound does more than just provide you with fabulous entertainment options. You’ll enjoy a level of planning and coordination that allows your day to flow like clockwork. We Offer Photographers and Videographers! Multiple Services One Contract. You have no worries. Spectrum Sound is there. We coordinate critical party details, logistics, and announcements with your other wedding vendors to keep everyone on the same page. Your caterer and our photographer will know what’s happening because we’ve communicated your dreams to all of them. Get ready to live your dreams! Don’t wait. Popular dates do fill up quickly. DJ Terry Tunks and his talented team of Dj’s have entertained at many thousands of wedding receptions and events over the years. Evansville, Indiana, Newburgh, Indiana, Owensboro, KY and across Southern Indiana and Kentucky. In towns like JASPER, NEW HARMONY, FERDINAND, FRENCH LICK, WEST BADEN, HUNTINGBURG, AND SANTA CLAUS, IN. Based at one time in Louisville, KY because of sponsorship of Coca – Cola. SPECTRUM SOUND is just as comfortable entertaining small groups at a casual affair to 18,000 at the THUNDER OVER LOUISVILLE DERBY CELEBRATION. All documents and Articles given by Terry Tunks and Spectrum Sound may not be reproduced in any form, including copying elements design for any personal and commercial use.